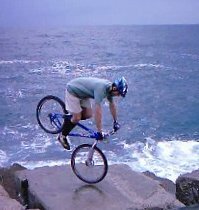 OK, that one is not really a trialsy move, though on some occasions, you may have to bounce your front wheel away from a cup or stuck position, if you are rolling down some very steep terrain. But it is a nice and easy trick to please a crowd at a demo. Assuming you master the endo, just pull the smoothest one you can. 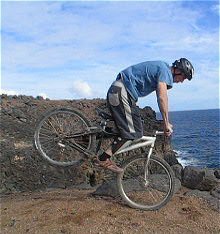 1° Reach balance on top of the front wheel, keep your arms straight, and flex your knees to lower your body on the bike. 2° Arms stretched, give a very brief impulse with your legs (extending again from the folded knees position) to compress the tyre. 3° Exploit the bouncing effect from the compressed tyre by folding your knees back again, and let the whole bike bounce back from compression. Notice how far your shoulders should go over the bars to maintain balance on the front, with your center of gravity above the front hub, else you'll fall back again. The arms should really be locked in a stretched position, and the feet can actually pull the bike backwards by gripping vertically on the pedals. Don't try to pull the bike up with your arms, but instead, rely on your legs and body weight to do the pumping work. You'll have much more power and bouncing effect using an impulse with your legs than pumping with your arms, so don't waste your energy. The whole trick consists in compressing the front tyre (low pressure helps) so that it bounces back (at that time you just fold the knees back). 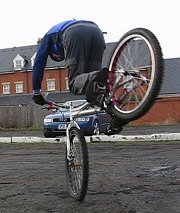 When you are confident enough on the front wheel, you can even turn around while bouncing. To do this, before each hop let the frame turn slightly on your best side (usually the side of the driving pedal). 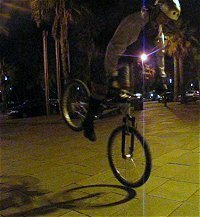 And every time you bounce off the ground, straighten the bars in the air. 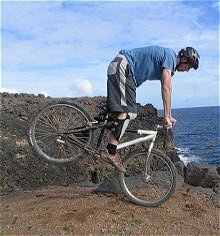 Keep your body slightly off-centered so that every time you hit the ground with the front wheel, the frame slightly falls aside (and carry on until exhaustion or until you've smashed your record number). Rolling down some steep terrains, or in rocky zones, the front wheel can get stuck in a pot hole, with all your weight on the front wheel. The only way out (apart from a crash over the bars) is to bounce the front wheel off the pot hole.